At the end of 2010 I started Emealz and realized one simple truth: while I know how to plan menus and I love to cook, the truth is I get so overwhelmed with my life I DON’T plan our menus and therefore I DON’T cook. We were eating out way too much and it was a stress on our finances and becoming a stress in our marriage. Similarly, I know how to think for my kids. I know I want to have a plan for their spiritual growth. I DO think for my kids. I DON’T have a plan. I DON’T have time to create a specific plan. Tara M. DOES, apparently. At the end of 2010 Mommy Missions had an incredible sale and they offered a year subscription for less than half of their normal price. Shot through with a big dose of humility I signed up. I’ve only received the first month’s plan and it wasn’t for the kids. . . it was “For Mom Only: Refocusing the Heart”. It’s very simple – no rocket science but I have to say. . . it’s been over a week and I have memorized two verses and spent time each day in prayer for my heart and my kids. Truth? I have had the plan since mid January and just started it in February. I realized I was going to have a hard time following along if I didn’t do something to get the plan in front of my face. So, I added a Touch of Cutesy (the purple dots are just there to cover the assignments. I want to honor Tara and not share her work) and printed an 8×10 photo for $1. It is now in a frame on my desk where I will see it every morning when I sit down to do my Bible reading, check my email, and make my daily to-do list. WOW what a great idea!!! That is so awesome and such a blessing to me that God is using it in you and your family's lives! Blessings to you and HUGS! you should partner with Tara and sell those!!! 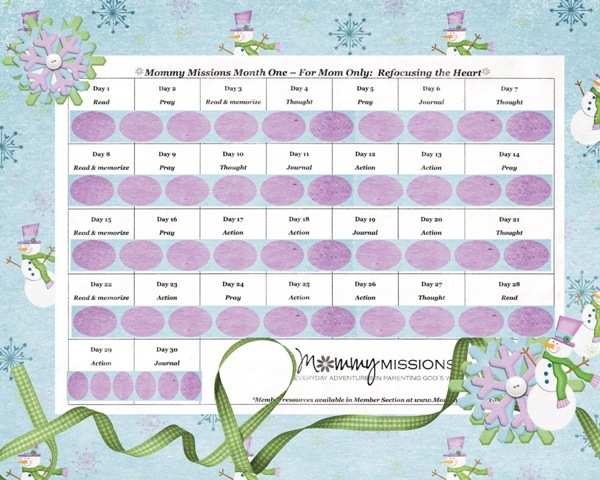 I am using Mommy Missions too and it is so awesome because it gets me started on something and I can expound on it however I see fit.